Review: While driving through West Lafayette the other day, I noticed a new restaurant in the River Market, where Sofra, the Turkish restaurant, used to be. So I immediately came home and started searching for more information about this place, and lo and behold, there is none! I am willing to bet I’ll be the number one hit in Google for this restaurant very soon. And they aren’t lying, they do have quite items ranging from all over Asia, starting with the Malaysian appetizer to the Japanese noodle soups. The restaurant itself is quite small and casual. It has a number of small tables and some booths, and was fairly vacant when we arrived. However, by the time we left there wasn’t an empty seat in the house. The place was nicely decorated if a bit sparse but the furnishings were nice and the place was clean. The menu wasn’t expansive. It had two appetizers, some grill items like Teriyaki chicken, some noodle bowls and then their “pot platters.” Each table has a warming unit where they bring out a pot of water. You pick your meat and then you boil your own meat at your table. This is served with rice, vegetable, and soup. I was really curious about the “Oishi Dango” appetizer, so I ordered what was promised to be Japenese beef, pork, and shrimp balls with chili sauce. And they were in fact, just meat balls – two of each kind of meat. With the chili sauce. They weren’t bad. They were very spicy but the texture of the balls was similar to spam and kind of eeked me out. I ordered the chicken teriyaki, which is generally a safe bet. How hard is it to slap some teriyaki sauce on some chicken and throw it on the grill? I would give the teriyaki chicken a thumbs up, it was very tasty. My husband ordered the Shabu Noodles, which came out as a giant bowl of soup full of the same meatballs from the appetizer, Ramen noodles, some kind of boiled meat, tofu, and some vegetables. It came with a side of dipping sauce. Just looking at it scared me. He ate it and said it as okay, but nothing exceptional. 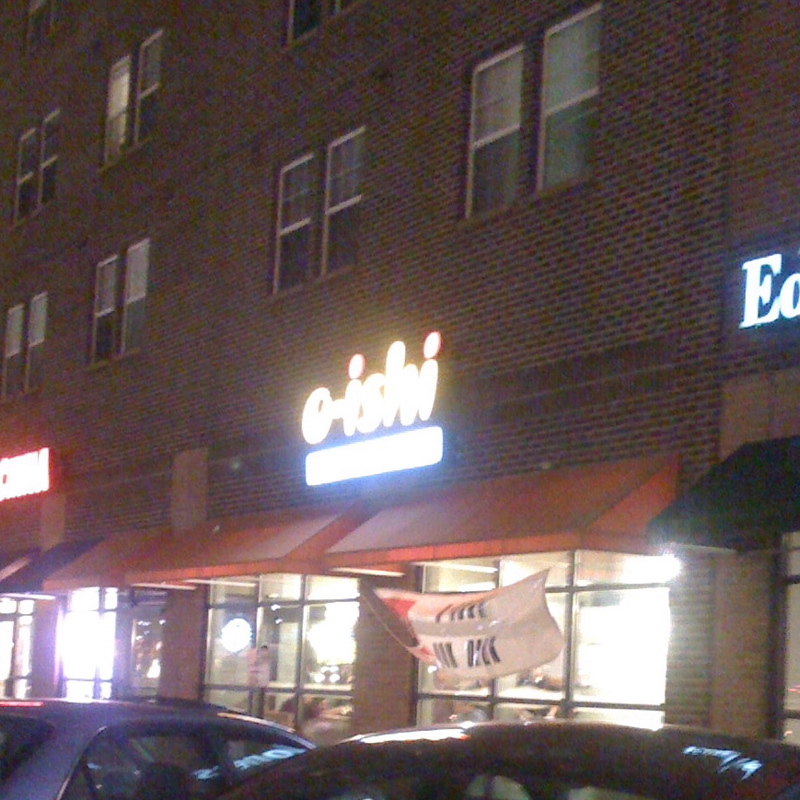 What stood out at O-ishi, though, was the service. They had one waiter for the entire restaurant. There were only two other couples there when we arrived, and it still took forever to place our orders. When finally the Shabu Noodles came out, my teriyaki chicken was still not ready. The server explained it would be right out, but it was not. In fact, it was quite some time before the chicken was ready. The restaurant was also very cold and I spent the entire meal shivering. I may be the only person whose experience wasn’t great because as I said, the whole place was filled by the time we left. But overall, it didn’t inspire me to go back again anytime soon. Kid friendly: Yes/No. It was casual and there was a child there when we arrived, but there is no children’s menu and the food may be a bit scary for some kids.